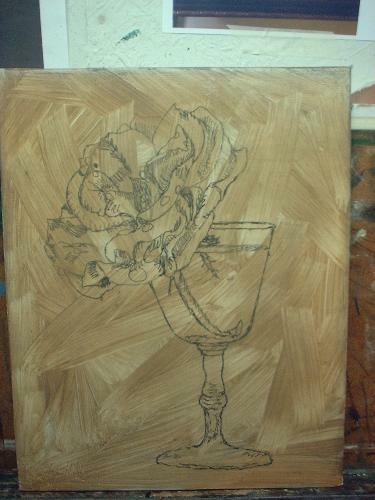 Rose Drawing Grisaille layer demonstrated, the dead layer of our single rose. 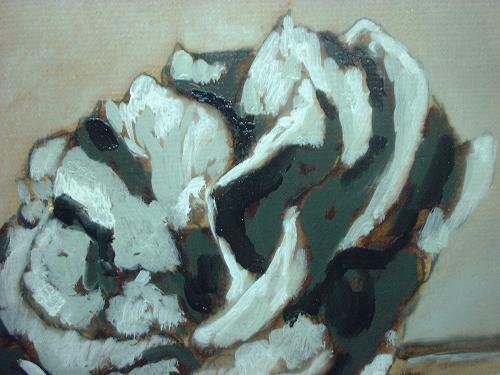 We started with a rose drawing and now move to the dead layer of painting demo here with the imprimatur part of the painting. It is put in quickly with a large brush. Then the brush strokes are smoothed out with the blending and dry mop brush. This photo shows the complete umber under layer. 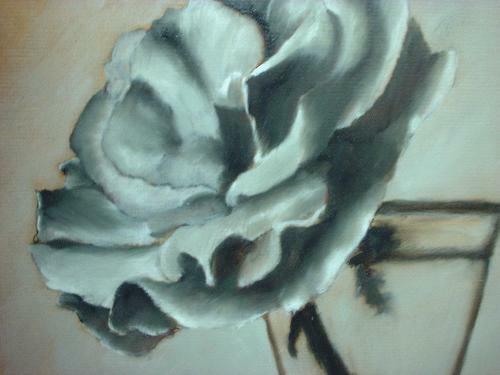 I've taken a short cut by adding white to this layer and I wanted a very bright rose in the end. These next 2 photos show the application of paint. Only about 4 different tones of grays are used because this is so small. 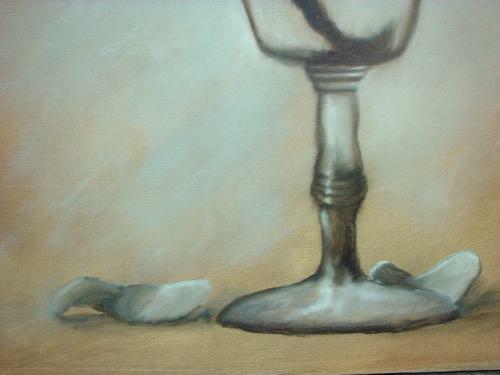 But taking your time, when blending these grays together, will give you a convincing shade, shadow and half shadow variance to make for a realistic painting. There are several approaches. You can mix the grays on the palette then apply them to the canvas. Or you can mix fewer shades of gray then apply the paint. Once on the canvas, you can use a another empty brush to blend the paint right on the canvas to give you all the various shades of gray. Much of the grays here will be blended right here on the canvas. 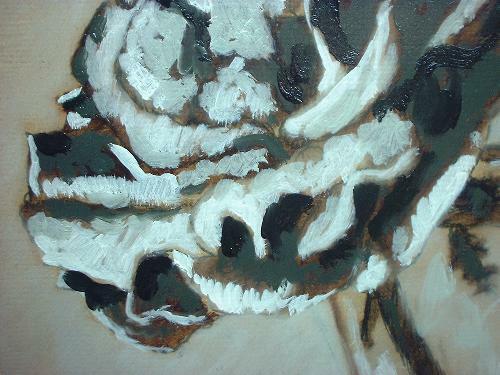 This is one of the things I truly love about oil paints! A shot from back after the correcting and final blending have been completed. A close up of a few pedals I've added for interest. I'm still trying to decide on the final color of this rose. I've posted a few pics to my favorite art forum to get a little feed back from fellow artists. 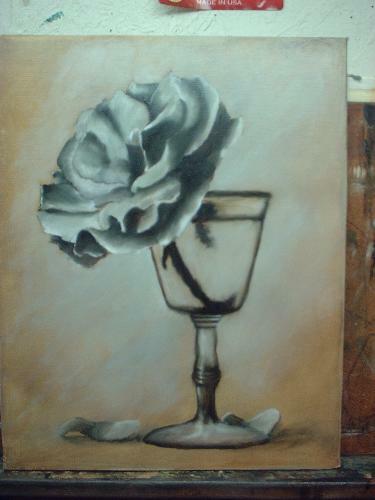 Well, its been a few weeks, and I've got some answers back, and my rose is now completed! Come join me and see the color layers and finishing layers of this petite piece! 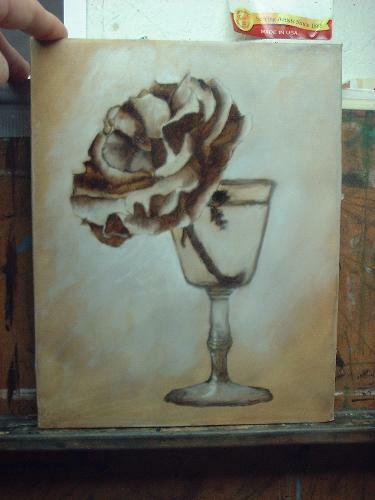 Color layers and finishing layer of this rose drawing and painting demonstration.